This entry was posted in All Other Perfume Houses, Florals, Fruity Florals, Perfume Review, Robert Piguet and tagged Mademoiselle Piguet, Mademoiselle Piguet Perfume review, perfume review, Robert Piguet, Robert Piguet Mademoiselle Perfume Review by Kafkaesque. Bookmark the permalink. Can’t see this becoming very huge, if only for the reason that it sounds a bit like ‘Miss Piggy’. I can imagine how this smells PERFECTLY from your review. I feel as if I have actually smelled it. It’s like all of these clothes in the “missus” sections that are cut and appropriate for teenagers. Does no one design for grown women any more?! I definitely think that the perfume houses equate “greater sweetness” with “appeal to the younger market.” Particularly where fruity florals are concerned! The thought of a fragrance that smells like bug spray turns my stomach a little. When I was at university, I studied abroad in West Africa and slept in a cloud of bug spray for months until all the mosquitos died because it was too hot. To this day, I try to avoid using anything with DEET, so a perfume that is reminiscent of it is probably not for me. Thank you though for the wonderful review! They are always the bright part of my day! How fascinating about Africa! It’s definitely a place that I’ve always wanted to visit but, given how mosquitos will single me out in a crowded room, I would probably sleep in a cloud of bug spray too! Before I left, I was given the choice to studying during the fall or during the spring. When I asked what was the difference, the answer was that in the fall, it’s cooler but there are a lot of insects. Clarification revealed that it was actually swarms of mosquitos and an actual, literal plague of locusts (the woman said that there were so many that you just give up and accept that you will walk on a carpet of dead bugs). In the spring, it gets so hot that all the bugs die — including the mosquitos. I went in the spring! But there were still some buggy nights! Poor Kafka, you’re having a tough sampling stretch lately. I hope there are some better perfumes in your future. You don’t need any extra sweetness in your life, you’ve got the Hairy German. I like orange blossom so I would sniff this if I see it. It seems like a lot of orange blossom scents have reviews where people either love them or hate them. I think the bug spray note might be a deal breaker for me more than the sweetness. Sorry. I have no idea why/how that posted twice. 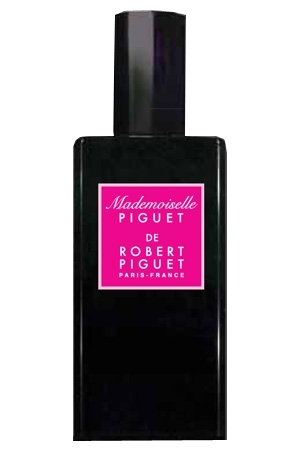 Mademoiselle Piguet isn’t too hard to find, so if you like orange blossom and stumble across it, I would definitely give it a try. But on SKIN, as a few people have said it smelled fine on paper, only to discover something else when actually applied. If it’s any consolation I tried a perfume I thought I would like today and it’s a scrubber. I tested 2 others and they were both gone in 60 minutes. Three strikes. Three in ONE day??!? You poor, poor thing! Believe me, I sympathize! Dare I ask what the scrubber was? Serge Lutens Vitriol d’Ouillet. The carnation one. It started off okay but then went from bad to worse. Usually I don’t dislike anything enough to bother scrubbing since very few scents last long on me but at the 90 minute mark I was waving the white flag and heading for the sink. It did not play nicely with me at all. oooh, goody! and I will get back to you on how it reacts on my skin :D!! I did post a comment but then it disappeared! However I noticed that poodle’s was posted twice so I will wait to see if my comment re-appears! Anything that is compared to Tubereuse Criminelle should be kept far, far away from me! I think it’s the sweetness in this one which you’d have the greatest problems with, Lucas, along with the very excessive floral overload. It is NOT a harmonious floral at all. *choke* I almost just spat out my coffee. Absolutely HILARIOUS, my dear! I can’t stop laughing! It sounds okay…until we get to the bug spray portion. And the sweetness portion. Ug, the sweetness trend also needs to go far away. I wonder if orange blossom/orange anything is more difficult to capture than I thought it was. Especially after our respective experiences with Seville a l’Aube and your experience with Azemour. I am the queen of ” blind buys” and this one was high on the list. My internal warning goes off with the words green, galbanum. I had invisioned something wonderful with orange blossom, almond, tonka bean…..boo:(. I had the same visions, Debbie! I think you should order a sample off eBay or Surrender to Chance to see if it works for you, because, who knows, it might. But, I BEG of you, do NOT buy a full bottle blindly!! BTW, I am waiting for the proper moment to tell you all about my foray into the note that shall not be named. I will do so the next time you review a perfume with that note — you haven’t lately unless I missed it.